Acceptance notifications are mailed by March 10, 2019. 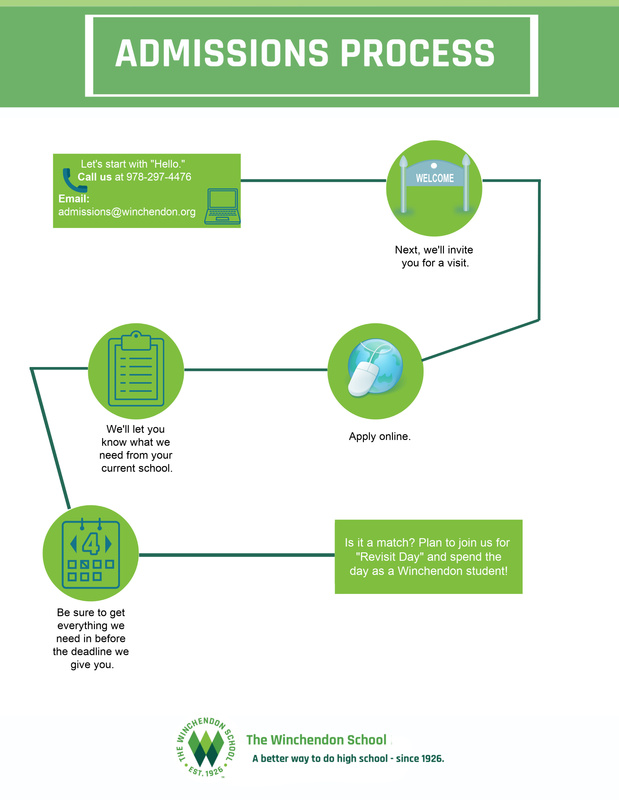 Financial Aid applications are due by January 31, 2019. Contact the Admissions Office at 978-297-4476 to express your interest in The Winchendon School, or complete an online inquiry. To arrange a campus tour and interview, please contact the Admissions Office at 978-297-4476, or email [email protected]. We host candidates Monday through Friday with limited availability on Saturday. The campus visit lasts approximately two hours. If a visit to campus is not possible, interviews can also be completed by Skype. For 9th and 10th grade applicants, register to take the Secondary School Admission Test (SSAT) through the SSAT website or by phone (609-683- 4440). Be sure to list The Winchendon School (School Code 8242) as a school where your child is applying. The school also accepts ISEE and/or Educational/Neuro-Psychological Testing (i.e., WISC, Woodcock-Johnson, WIAT, etc.). For 11th, 12th and PG applicants, Winchendon will accept the PSAT, SAT or ACT.